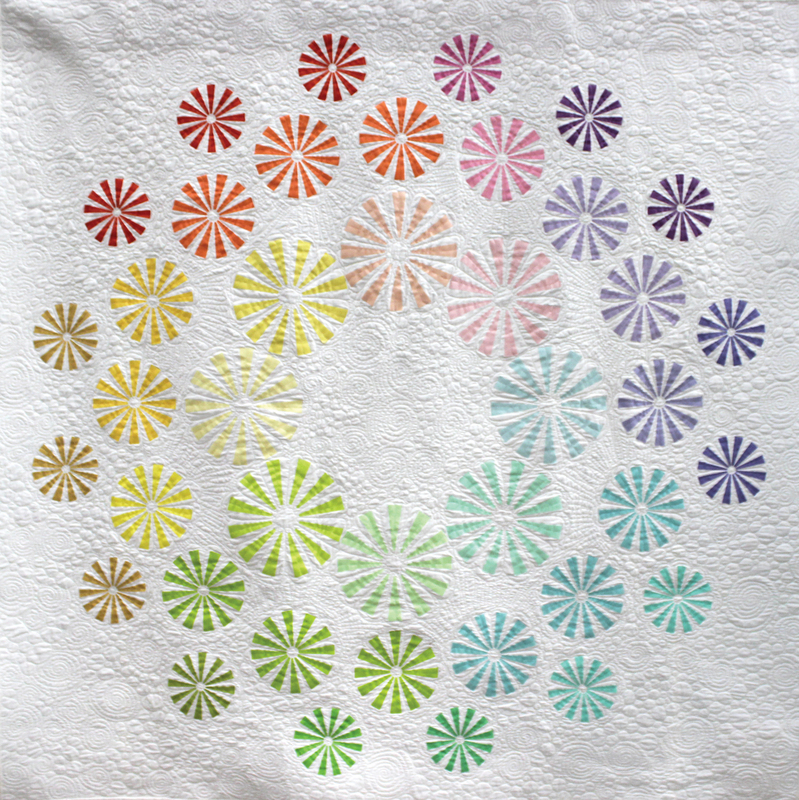 Happy New Year and welcome to today’s interview with Dora from Orange Dot Quilts. I met Dora through my time on staff at Generation Q Magazine. She had entered some entries in my Block Builder Feature there and we published Boxing Play – the green and blue quilt behind Dora in the below picture. 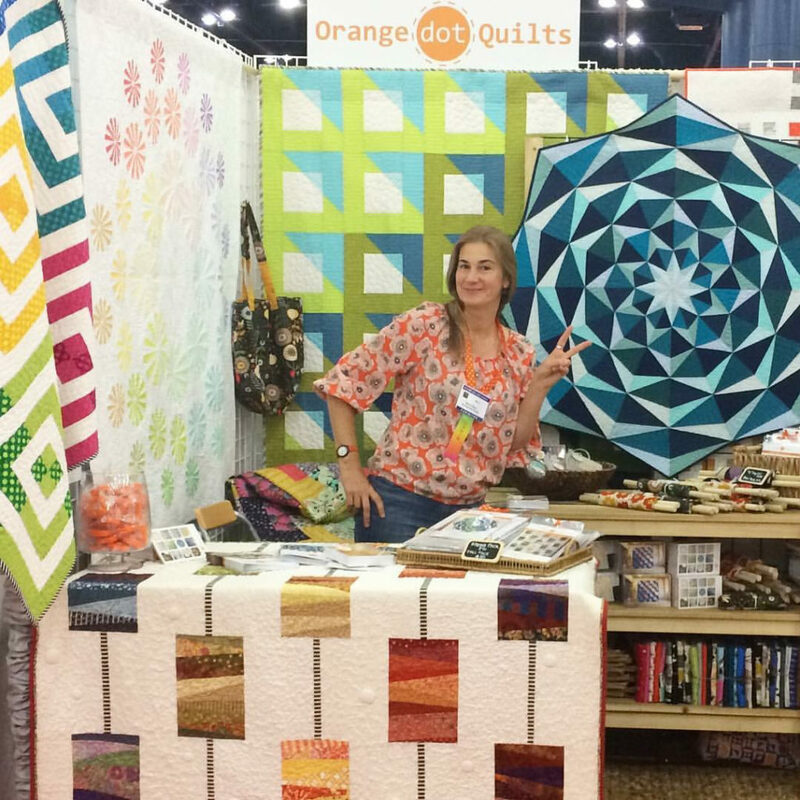 I don’t think she was “Orange Dot Quilts” yet, but I think she started the company up soon thereafter if not before. Dora has an eye for design to be sure. I met Dora in actual PERSON last spring at Quilt Market and was delighted to put a person with a face! And an accent! You can’t hear a Romanian accent in emails! I thought that I would start 2018 with an interview because I would like to do more of these here at the Blue Nickel. 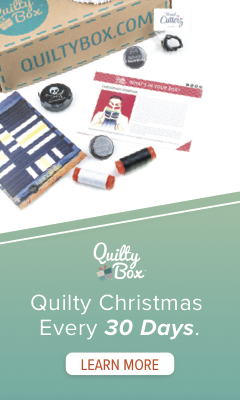 There are so many interesting Quilty Peeps in my life, and I’d like to introduce some of them to you. If you already knew of them, maybe you will learn something about them that you didn’t know before! For the record, I still think Boxing Play is an amazing quilt – ScottWhere are you from originally? I was born in Romania, in Eastern Europe where lived most of my life under a strict communist regime, and I think that made me appreciate freedom a lot, including the freedom of expression that quilts allow. 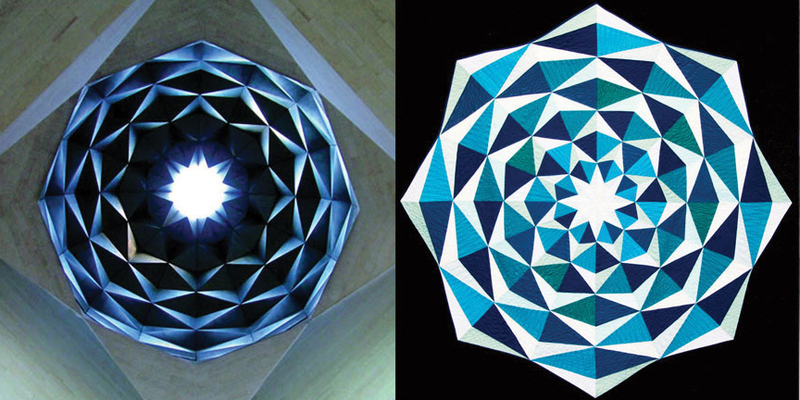 My degrees in engineering and graphic design have helped me tremendously in my path as a quilt pattern designer. I immigrated to the United States in 2001. I’ve been sewing since I was 8 years old, taught by my mother. Mom was a nurse but she made clothes for everyone in the family, in her few hours of free time. She inspired me and I started immediately to create an haute couture wardrobe for my doll. That clothing line was my pride and joy. ☺ I went on to create and sew most of my clothes as a teen. We lived in communist Romania and, by the time I was a teen, all the shops were completely empty of any merchandise. Sewing was more of a necessity than a hobby, but I loved it nonetheless. Was it always quilts for you, or do you sew other stuff as well? I know how to sew, knit, weave, crochet and embroider but, since quilting was (and, to a large extent, still is) completely unknown in Romania, I discovered quilting only in 2006, five years after I moved to the United States. So it wasn’t always quilting for me. ☺ I made my first quilt in 2008 and not stop since, but I have been sewing almost constantly throughout my life, making clothes, home décor and plush toys. I find it impossible to copy someone else’s style. Even when I try, in order to learn something new, I always end up in a place and with a quilt that makes sense to me. For me, it is definitely much easier to be inspired, than it is to copy. What is your favorite traditional quilt pattern? Nine Patch because I love the simplicity and the versatility of that pattern. Two of my patterns are inspired by it: “Patch Nine” and “On the Plus Side”. I use a different piecing technique in my patterns, but the inspiration is solidly in the traditional Nine Patch. 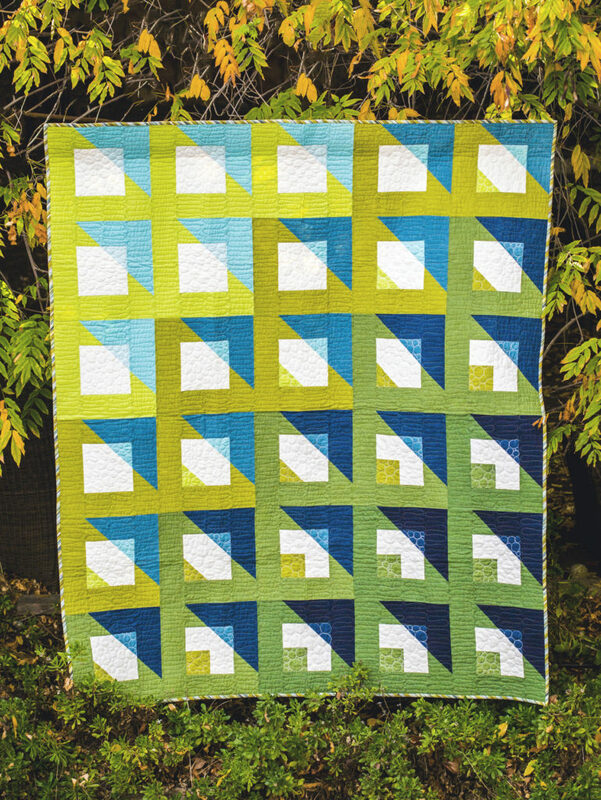 I also love Flying Geese and traditional star blocks. Favorite TV shot to binge watch? How It’s Made, The Great British Baking Show, Project Runway, Downton Abbey, Mad Men. Cake. Chocolate cake, to be exact. Favorite place to go when you were growing up? 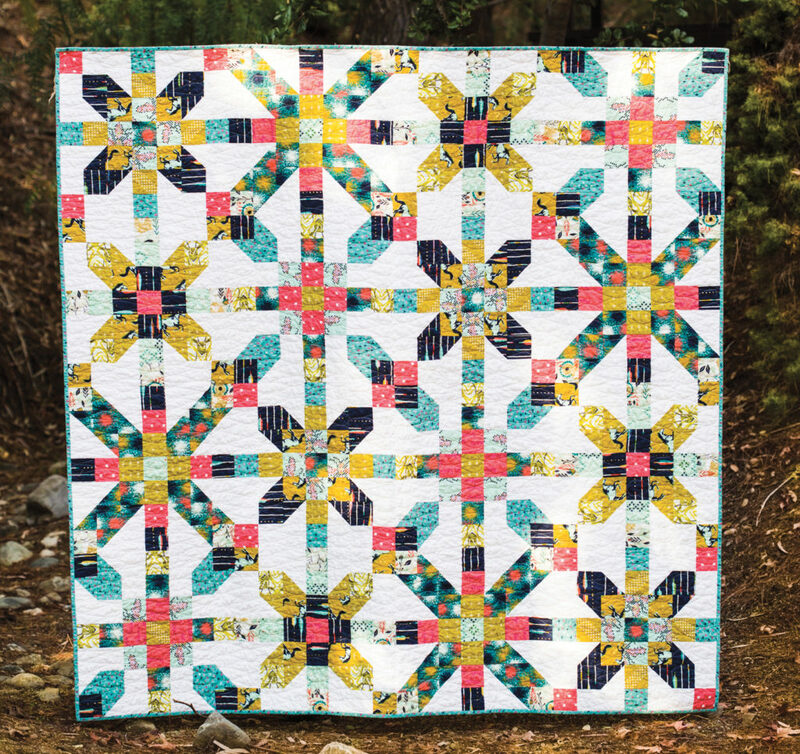 Orange Dot Quilts – It’s All in the Name! 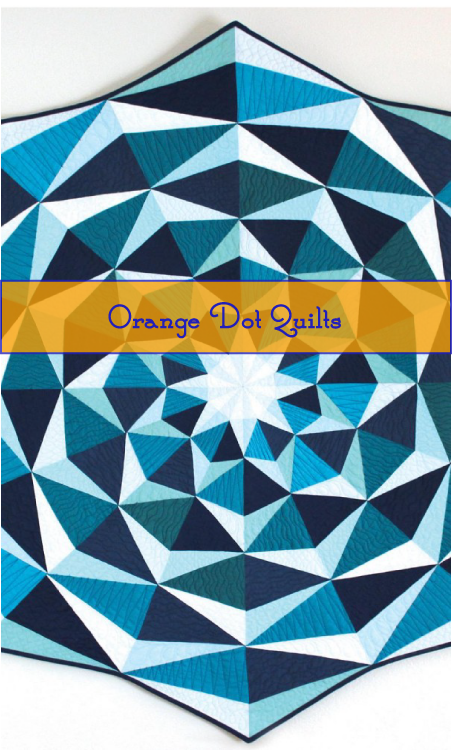 Where did the name Orange Dot Quilts come from? Well, it is like this: orange makes me happy I like all kinds of colors but favorite was always orange, the deeper, darker shades of orange. I grew up in period of time in my native country where everything was grey, drab, sad. Orange is quite the opposite of all that so I could not help falling in love with it. 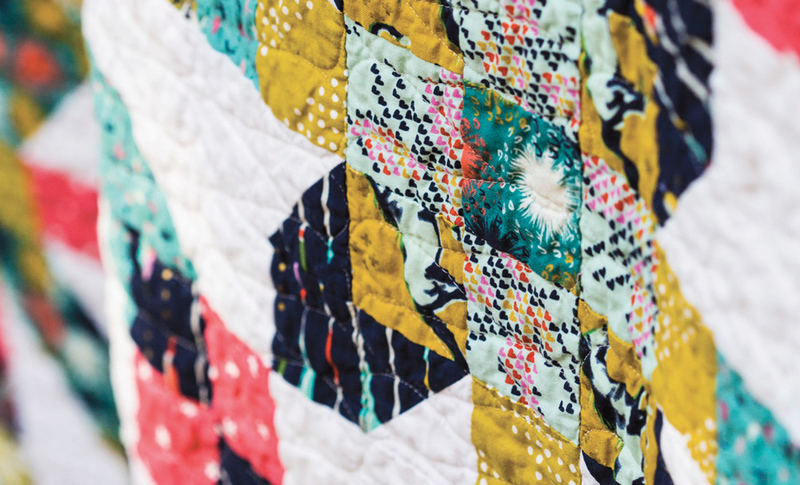 Also, dots make me happy – I love polka dots, they make me smile; quilts make me happy, too. 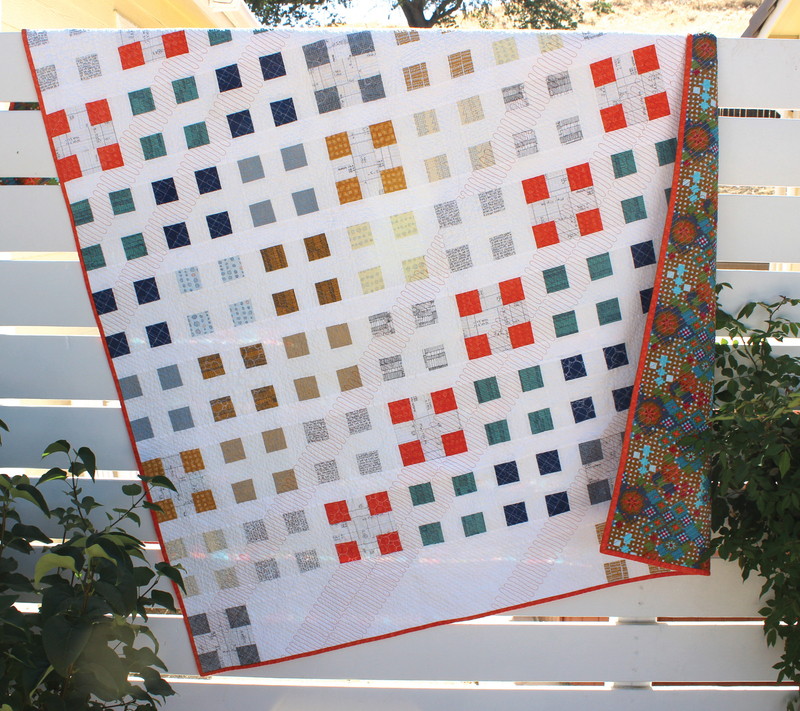 So, I put together three of my favorite things and they sounded good together: Orange Dot Quilts. So it was settled. The short answer to this question is: they all make me happy. Can you tell us what your plans for the future include? Someday, I would love to keep creating new patterns and find ways to simplify sewing and quilting techniques (I developed a No Baste method that works wonderfully well when quilting on a small sewing machine), to travel the world teaching quilting and getting inspired, and sharing what I learn, and constantly learning more so I can share more. Another project for the future is a book about my simplified techniques and a few unusual patterns. And last but not least, maybe a You Tube channel with my sewing techniques. I did not realize they are a bit different until I started to teach quilting and heard the feedback from my students. Do you have other creative interests? I love to reinvent old furniture into something new (did not have much time for that, lately), to create house plans (I helped to design three houses so far and now I am working on the plans for my dream studio that I hope to be able to build, one day), and I am learning to play guitar. Quilting gives me the freedom to express myself. I love that it allows me to be creative and fearless (it is just fabric, after all) and unique while also giving me a finished product that I can use in a very real way. Quilts are filled with love and so much work and skill and patience. They are works of art and in the same time they are utilitarian, they provide warmth, protection, love. My quilts are constantly used, and I love that. How is quilting (and other needlecraft) different in the US as opposed to your country of birth? Quilting was not known in Romania until recently and even now it is known only on a very small scale and entirely because of the Internet. Quilting stores are non-existent in Romania and the few Romanian quilters spread throughout the country keep in touch and shop online. Other needlecraft is alive and well in my country of birth, such as embroidery. The Romanian blouse is well known for its heavily embroidered traditional beauty and it was immortalized by Matisse in one of his paintings. There is a strong movement of reconnecting with the traditional past through handwork and a return to the simpler pleasures of creating one’s own unique clothing, similar with the handmade movement that is happening in the US right now. Knitting is also very common in Romania, as well as crochet, cross stitching and weaving. Can you show us pictures of your studio? what do love about your space? what would you change? 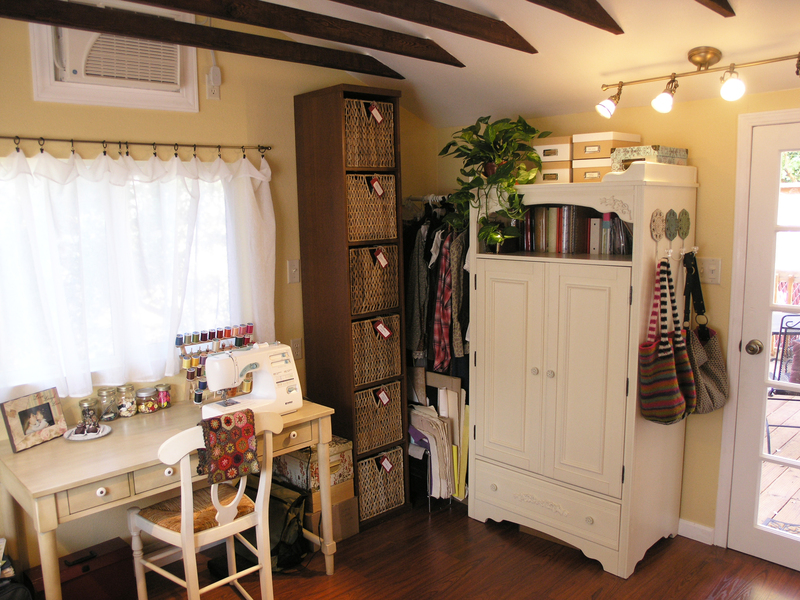 My studio is a room I am renting in the town near the place where I live. It is a small room and I wish for a little more space. It is very bright and everything is close to me so I can just turn around from my sewing machine to my quilting machine (not a long arm), to my cutting board and my ironing board in just one move. I also love that I have a large design wall that takes up a whole wall of the studio. When I create something then all the fabric comes out and it gets crowded fast. But I love that creative chaos! 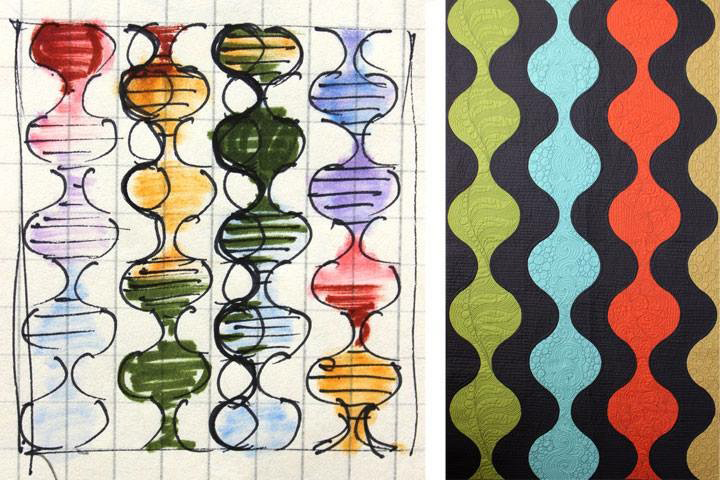 Usually, the fabric that did not make it into one project will inspire a new one. 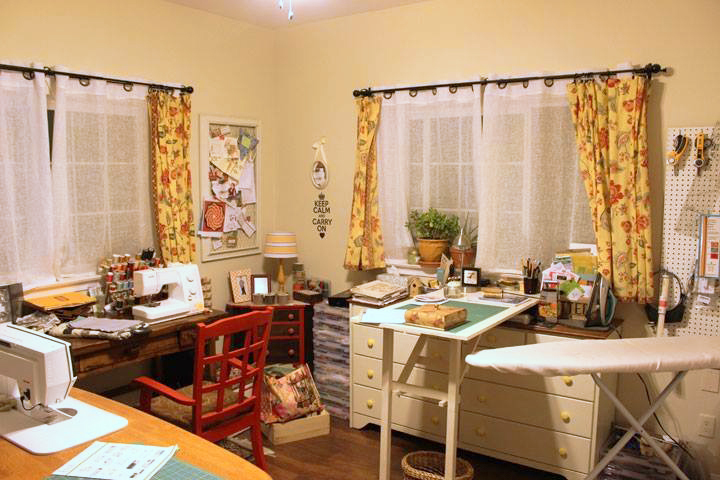 Orange Dots Quilts – Dora’s Sewing Room at home doubles as a guest room. Where you can find Dora! So there you go, the First Official Blue Nickel Interview of 2018, Hope you enjoyed getting to know Dora better. Let me know if you liked this and I will try to get more interviews here on a regular basis. I LOVE getting to know my quilting friends better! And Dora has a special deal for you!! How interesting and talented Dora is. 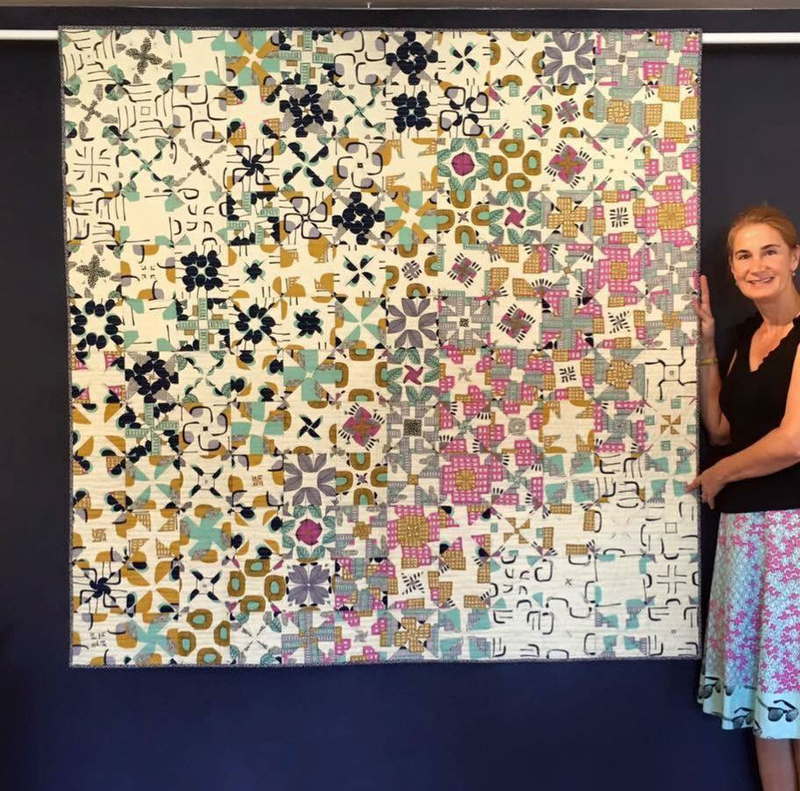 Her quilts are beautiful works of art. I am glad you interviewed her. Hey Lynn, glad you enjoyed the interview! Dora is the tops, isn’t she?